I really love it when things show up in my life that are such a good match to something I’ve been pondering, or thinking about doing. A few weeks ago, I wrote a post about keeping a journal, and I talked about my idea that I might have luck, finally, with journaling if I just let myself write whatever I wanted in it. I wouldn’t demand consistency from myself; I’d just let the journal take shape with all the scraps of my life and thoughts and imaginings that I might think to jot down. So after writing that post, I did start journaling, exactly as I mentioned: eclectic snippets of this and that. And I discovered myself also jotting down notes about different story ideas too, because they are so much a part of my daily thoughts. I’m pretty sure I gave a gasp of delight. Agatha Christie’s Secret Notebooks! I’m a huge Christie fan, and as a writer the thought of reading through her notebooks is so very exciting. She employed her Notebooks as diaries, as scribblers, as telephone-message pads, as travel logs, as household accounts ledgers; she used them to draft letters, to list Christmas and birthday presents, to scribble to-do reminders, to record books read and books to read, to scrawl travel directions. She sketched maps of Warmsley Heath (Taken at the Flood) and St. Mary Mead in them; she doodled the jacket design for Sad Cypress and the stage setting for Afternoon at the Seaside in them; she drew diagrams of the plane compartment from Death in the Clouds and the island from Evil under the Sun in them. Christie didn’t even stick to just one notebook at a time. She kept a batch of them around, never dated anything, and in one notebook there are notes that span 17 years! This is the notebook habit that I have just started, and Agatha Christie’s Secret Notebooks is inspiring me to keep on track with my own eclectic form of journaling. 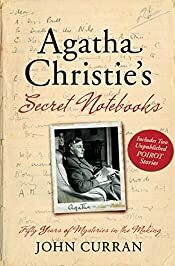 I’m still digging into this book, and so far it’s been really wonderful to see how she worked on plot ideas amid other snippets of her life; if you’re an Agatha Christie fan and a writer, too, I think this is definitely something you might want to check out. The only thing to keep in mind is that there are, as author John Curran warns, hints to the endings of various of her works scattered throughout. Since I’ve read almost all of Christie’s novels, this isn’t a problem for me; if you haven’t, each chapter very considerately includes, at the beginning, a list of books for which the solutions have been revealed. This entry was posted in Books and Reading, Writing and tagged Agatha Christie, In the Middle Of, journals, mysteries on March 12, 2010 by Belle Wong. The book sounds fascinating! After your journaling post, I dug out a journal I started when we moved to France – I didn’t even make 6 months in it. And whenever I’m in a different city or country, I always have this urge to scrapbook! I never do get around to it, though, and then I end up with a box full of receipts and tickets and brochures that I’m reluctant to toss but never do anything with. Belle – I’m so glad you are enjoying this book! I am extremely eager to get my hands on a copy, as I’m a very ardent Christie fan, myself. I think it’s fascinating, anyway, to find out how authors do what they do, and this book seems to give some real insight into Christie’s writing. .-= Margot Kinberg´s last blog ..Gang-Related Incidents…. =-. It’s definitely a fascinating read, Margot. I’m putting it on my wish list because I know I’m going to want my own copy once I have to return this to the library. I have to get that book! I read every Christie book between grades 7 and 10. I’ve reread all of them at least once – some several times. It’s about time to start rereading some of them again. She’s so brilliant. .-= Jemi Fraser´s last blog ..Treats! =-. You sound just like me! I’m pretty sure I was in grade 7 or 8 when I read my first Christie. I used to have a list of all her books – I made it my goal to read as many of them as I could find. Amazing commentary, especially the quote on chaos. The book sounds fascinating and one I will definitely check into. Thanks for the great info. .-= Cat Woods´s last blog ..What’s in your Tacklebox? =-. That’s exactly how I feel. Now my various notebooks with a page or two written in them seem more like writing treasures than ever before. And it’s been really helping me to remember to grab a notebook and jot down a thought whenever I have one I want to record. I think you’ve found your journal mentor in Agatha Christie. This book sounds so wonderful but I thought it wasn’t out yet. I’m heading out to see if I can find it. I’ll read anything Christie has written, even her to-do lists. This is really a fascinating book, Margot – it’s so interesting to see how she worked things out, and the personal to-dos and notes to herself are wonderful too. You’re right. I definitely have found my journal mentor in Christie! This sounds very illuminating. I love to read the “secret” processes by which authors go about writing! .-= rhapsodyinbooks´s last blog ..Variation on a Theme: “Why Did I Finish This” Friday: Review of “The Calcutta Chromosome” by Amitav Ghosh =-. I am going to make sure I find this book. It sounds fascinating! .-= Janel´s last blog ..Jumblicious 3/12/10 =-. .-= Kerrie´s last blog ..How’s your Kindle going? =-. Gotta love those serendipitous finds! I have picked up this book on three separate occasions, walked to the register, and then put it back at the last minute. I am ashamed to say that I have yet to read an Agatha Christie mystery (although I desperately want to – especially Miss Marple) and I am afraid that I will not relate to the journal since I am unfamiliar with her books. I absolutely love to read about how writers write….and wonder if I might initially appreciate the book from this perspective. .-= Molly´s last blog ..Jodi Picoult – Notes from Autograph Signing =-. Sounds like a great gift for someone who’s a Christie fan! .-= heidenkind´s last blog ..Appealing/Appalling Victorians =-. I love when it’s called ‘notebook.’ I have the same sort of thing…that I started about 13 years ago after seeing the movie version of Harriet the Spy. It’s funny to see how the subject of my writing has changed since I was 11. It use to be really observatory, then really dramatic in the teen years, now more contemplative. I still refuse to write in anything that’s not a legit composition book. .-= Kari´s last blog ..Review: A Roman Holiday =-. Love this, Belle! I have about 60+ Christie books so this will be right up my alley. Love the sound of your journalling too. Those nifty ideas that drift in and out. Delightful. Now I want a timeline of the books. I want to go back to all the pre-war ones, which I find really fascinating.